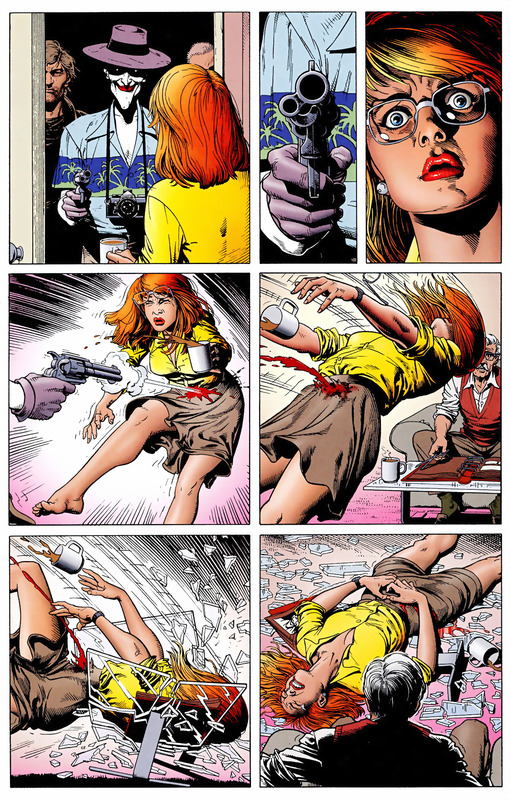 This entry was posted in barbara gordon, Batman, Commissioner Gordon, DC Comics, The Joker, The Killing Joke and tagged barbara gordon, batman, Commissioner Gordon, The Joker, The Killing Joke on May 11, 2016 by lowbrowcomics. The Arkham Knight harbors a seemingly deep-rooted grudge against Batman and fully intends to kill the Dark Knight after making him suffer. To achieve his goal, he has aligned himself with Scarecrow and provides a military presence in the evacuated city of Gotham during the events of Batman: Arkham Knight. One year after the death of the Joker during the events of Arkham City. Batman is struggling to come to terms with the absence of his nemesis and the uncomfortable feeling that the pair shared a bond deeper than either could admit. Without the Joker’s chaotic presence, Gotham’s citizens have never felt safer, and crime in the city has dramatically declined. However, this gives Batman’s enemies, including Penguin, Two-Face, and Harley Quinn, a chance to unite with the singular goal of killing Batman. On Halloween night, Scarecrow threatens the city with his newly created strain of fear toxin and bombs planted throughout Gotham, forcing the evacuation of the city’s six million civilians. Only criminals remain in the city, leaving Commissioner Gordon and the Gotham City Police Department outnumbered. Anticipating a new threat, Batman continues to develop crime-fighting technology and maintains a vigil over the city. Through unknown means, the Arkham Knight was able to monitor the actions of Batman and everyone else involved in the Arkham City incident. After Joker’s death, the Arkham Knight witnessed a brief encounter between Batman and the new Electrocutioner which resulted in the latter being quickly defeated. Afterwards, he executed the defeated criminal with a shotgun blast to the head, while explaining that men like Electrocutioner will come to believe that him and Batman are on the same side. The Arkham Knight later monitored Batman, as the Caped Crusader went to the abandoned Arkham Asylum to find an override code for bombs the Joker had placed in all of Arkham City’s walls prior to his death. 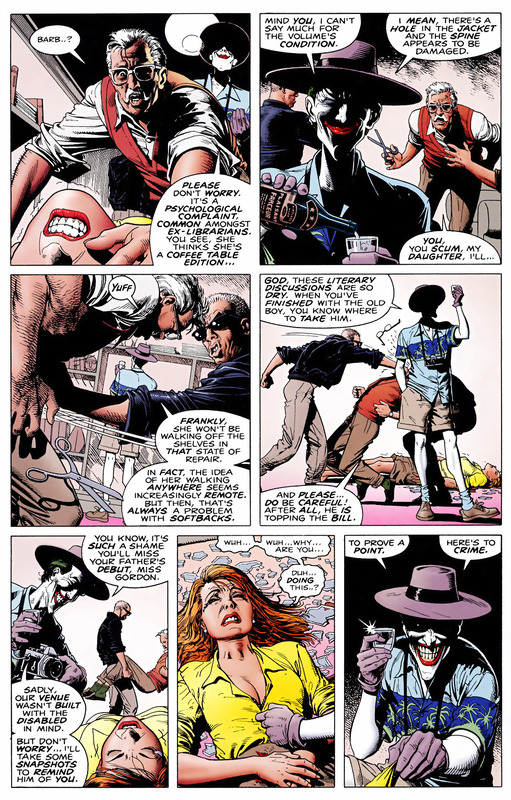 He knew that the Joker’s threat was merely a ploy to kill Batman, and that all of the explosives had actually been moved to the old Arkham Asylum. The Arkham Knight attempted desperately to open the door to the room where Batman was and all of the explosives were concentrated in, claiming that he wanted to kill the Dark Knight, albeit at his own time. Despite his effort, he was unable to open the door and was caught in the explosion. He apparently tanked the explosion, as seen by his steaming shoulder and chest plate, and scavenged through the rubble of the asylum in search for Batman. Instead of Batman, he found a scrapbook titled “My Dieary” with a ripped drawing of the Joker beneath, afterwards claiming”. The night’s not a complete loss”. Later, the Arkham Knight located two Joker thugs, who kidnapped and locked a family in the truck of a car, and attacked them. One of the thugs begged him to stop, but the Arkham Knight tore out the pages of the “My Dieary” book and shoved them in the thug’s mouth, before setting them both on fire, leaving the family to believe the Arkham Knight was a hero. Ever since the death of the new Electrocutioner, some members of the GCPD came to believe that Batman was “finally getting serious about these lowlifes”. A few hours after Batman apprehended Tweedledum, Tweedledee, and their newest member Tweedledie, the Arkham Knight executed all three of them in the Gotham Central Holding Facility with a shotgun blast to each of their heads, just as he did to the Electrocutioner. Not much is known about the Arkham Knight. Oracle reports to Batman that the man who works as Arkham Knight works with a black ops team out of Venezuela and intelligence sources can only agree that he goes by the moniker “Arkham Knight”. It is known that he is working with Scarecrow, that he somehow knows a lot about Batman, and that he wants the Dark Knight dead, but his exact motivations are unclear. The Arkham Knight operated at Ace Chemicals, providing soldiers, weapons, vehicles, and hazardous materials, as well as perimeter security for Scarecrow. As seen in the “ACE Chemical Infiltration” trailer for Batman: Arkham Knight, the Arkham Knight takes out the bridge connecting the plant to mainland Gotham City, ambushes Batman as the Dark Knight is rescuing a trapped worker, and again in an attack chopper when Batman is rescuing a second worker. Batman Arkham Knight #1 – Batman recovers Jokers body. Batman Arkham Knight #1 (part 2) – The Joker’s autopsy. Batman Arkham Knight #2 – The Joker’s last plan. 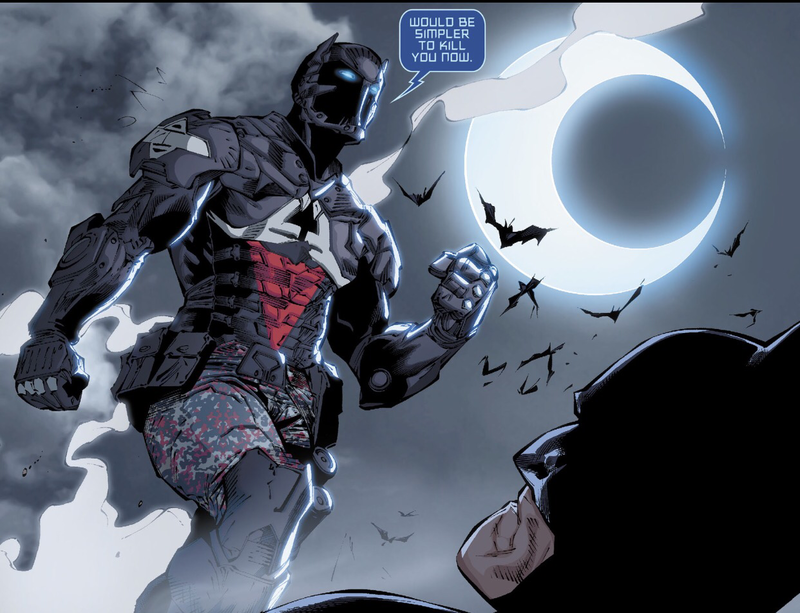 Batman Arkham Knight #3 – The Arkham Knight stalks The Dark Knight. Batman Arkham Knight #3 (part 2) – Batman and Jim Gordon dispose of the body. Batman Arkham Knight #5 – Batman “rescues” Harley Quinn from prison. Batman Arkham Knight #7 – The Arkham Knight takes out some thugs. Batman Arkham Knight #8 – Harley Quinn attacks Lucius Fox. Batman Arkham Knight #9 – Batman and Robin spend quality time in the combat simulator. 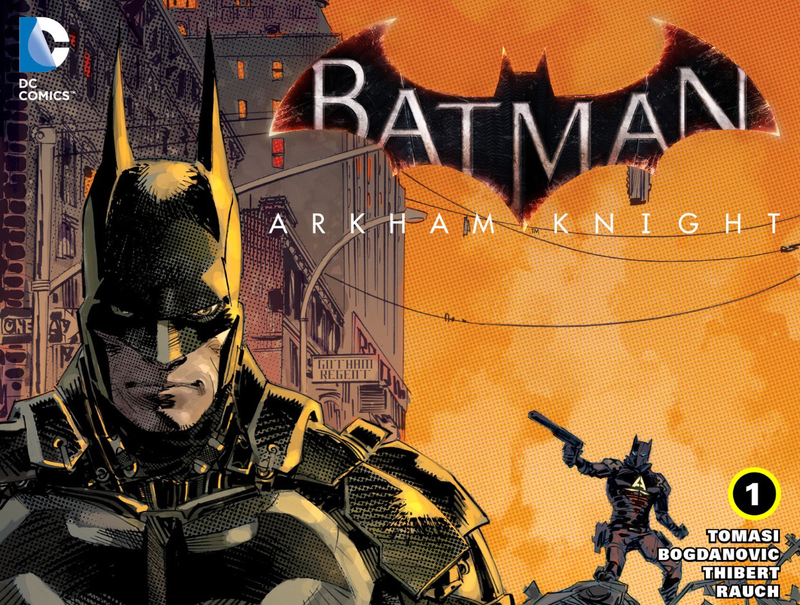 Batman Arkham Knight #12 – Batman vs. The Tweedle Bros.
Batman Arkham Knight #13 – Barbara Gordon can take care of herself. This entry was posted in Arkham Knight, bane, barbara gordon, Batman, Commissioner Gordon, DC Comics, Harley Quinn, Poison Ivy, Suicide Squad, The Joker and tagged Arkham Knight, batman, joker on June 10, 2015 by lowbrowcomics.